So, when it comes to life, I can be a wee bit selfish. This is especially true when it comes to Chick-fil-A. I'm just being honest. lol I LIKE my Chick-fil-A. I never had any idea what I was missing until I moved to the east coast. Of course, not long after we moved from Minnesota, they built the first one there! This winter, I've now been introduced the Peppermint Chocolate Chip Milkshake! Wow, that was a surprise. There was a peppermint crunch in every sip! One winter item that I haven't tried yet, but will be this Wednesday, is their Chicken Tortilla Soup. Doesn't that sounds like perfect comfort food? Are you planning any get togethers or Christmas parties? 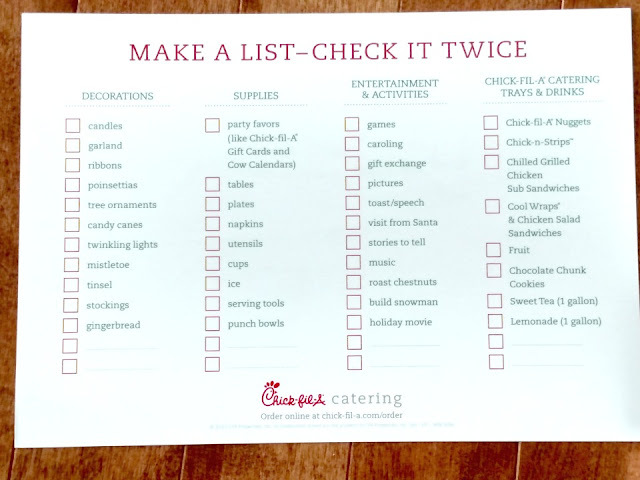 Did you know that Chick-fil-A caters?! Oh snap! Guess who will be doing my son's graduation party with their food in a year and a half? This mom! Anyhow, if you're planning a party, check out this checklist. It'll be a great help! 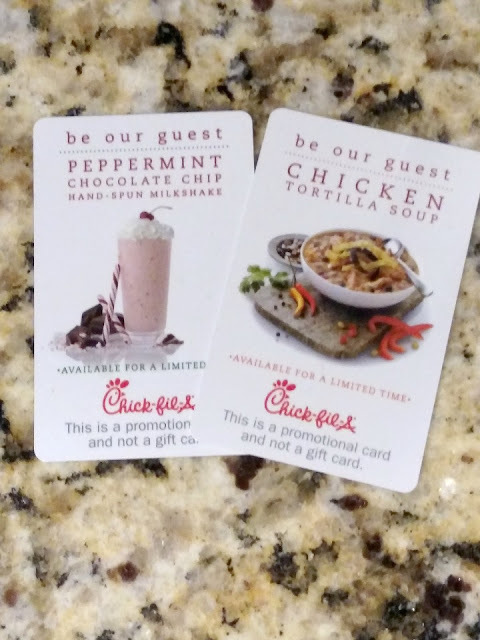 As a Chick-fil-A mom, I just received some fun promotional cards to try both of those items. Since I received two of each, I decided to give a couple of them away! Heck, why not, right? You will win a promotional card for one Chicken Tortilla Soup and one card for a Peppermint Chocolate Chip Milkshake. I like the Chick Fil A Chicken Deluxe Sandwich. I want to try their breakfast options, especially the spicy chicken biscuit. I would like to try their Bacon, egg & cheese biscuit. Chick-fil-a is my favorite place to grab a quick bite. No-ones chicken is a fresh and natural tasting as theirs is. Thanks for the chance to win & Merry Christmas Mimi. I would love to try their Cobb Salad! I would like to try the icedream cone. I never have yet. I've only had their original chicken sandwich (which is SO GOOD!) but I'd really love to try their peppermint chocolate chip milkshake! Bacon, egg and cheese biscuit!! YUM!! Bacon, egg and cheese biscuit...yum!! I like to try the spicy chicken sandwich. I'd like to try the Grilled Chicken Cool Wrap. I've never tried their soup. We eat there often, and I always get my favorites without trying something new! I would really enjoy trying the Grilled Market Salad. We just had a Chick-fil-A open nearby my town. I would love to try the grilled chicken cool wrap. I'd like to try their spicy chicken sandwich! I've never tried the chicken tortilla soup, so that sounds like a good choice! I haven't tried the chicken tortilla soup yet, so that sounds like a good choice!